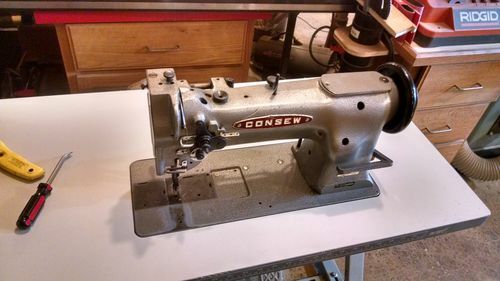 I wanted to re-mount my Consew 226 walking foot sewing machine in a better table, and I had access to a replacement top. The new top didn’t have the required recess to mount the head unit, so I needed to rout one out. 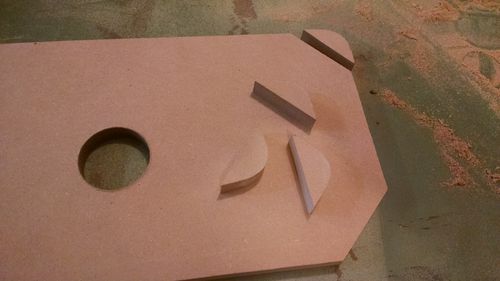 I started with a full-sized template of the shape I needed. 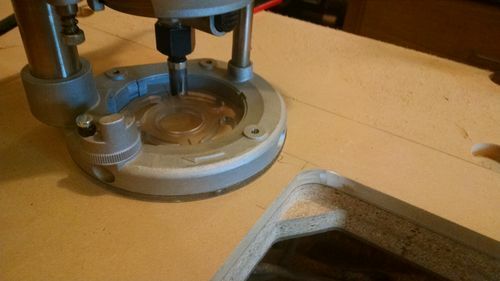 The corner diameter of the template needed to be 1-3/8”, and since I didn’t have a router bit that large, I used a Forstner bit to cut the holes. Then I completed the opening of the template with a router and spiral bit. Next I made removable corner inserts for the template. I’ll explain the reasoning for these little triangular pieces in a minute. They are easily made my marking the curve on some scrap, and sanding to the line. Then I cut them loose at the miter saw. 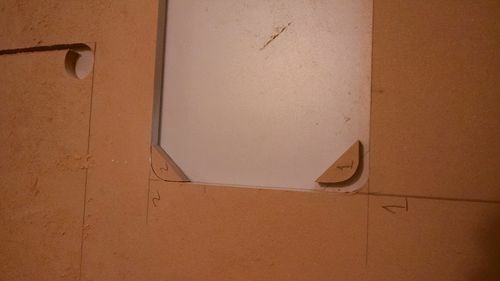 These small pieces were 1-1/4” on the smaller sides, and 1-3/4” on the hypotenuse. Then I used the template to pencil the shape of the opening on the sewing table top, and roughed it out with a jigsaw. 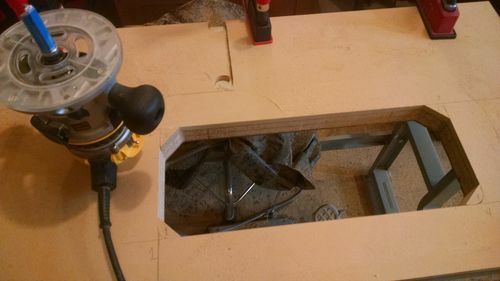 At this point I was ready to clamp the full-sized template to the table top. The corner blocks were carpet taped in place, and I routed the opening flush with the template using a 2” long bearing-guided template bit. Here you can see how the corner blocks protect the corners, which will eventually support the weight of the sewing machine head. 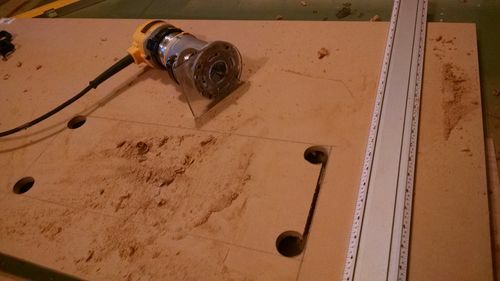 Next I switched to a 3/4” long bearing-guided template bit and removed the corner blocks. 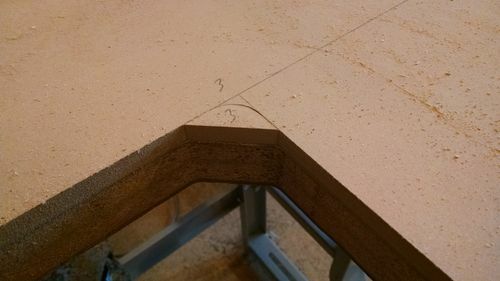 Then I was able to follow the template’s radiused corners to mill a small ledge. This cut was 5/8” deep, which allows 3/8” for the lip of the sewing machine, and 1/4” for the rubber bumpers that I’ll install later. The rubber bumpers are just some rubber mat that you can buy in bulk at the hardware store. They are tacked in place, one at each corner. 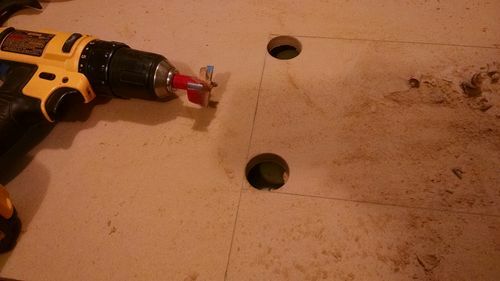 Then I drilled holes in a scrap of MDF with a 1-1/2” Forstner bit. I then used that as a template to rout holes for the hinges. 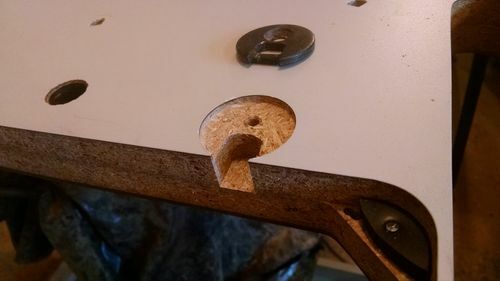 I could have simply used the Forstner bit to drill out the hinges, but I find the router cuts to a more consistent depth. 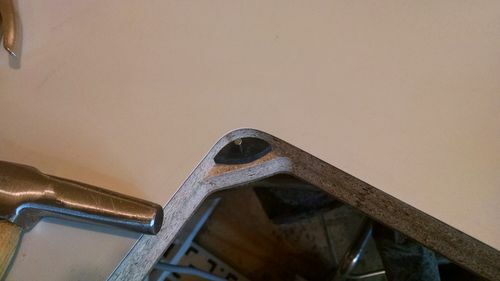 Then excavate a little spot for the hinge mechanism. This is easily accomplished with a trim router and 1/4” spiral bit. The fit looks good, and the router bits cut the laminate cleanly. It took me most of a Saturday to accomplish, but it sure looks nicer than the old table. 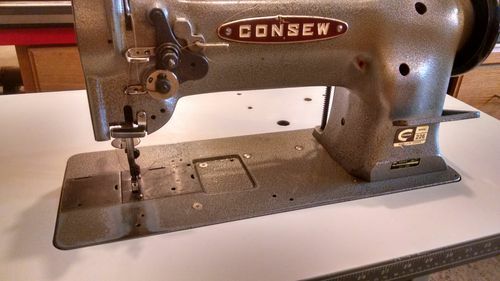 If anyone is contemplating a sewing machine build, I found this full-sized template method with corner blocks worked quite well. Really like your work and choice for the template. Thanks! I’ll certainly Favorite this’en.